Are you getting ready to launch your real estate business online? This is an industry that is growing year over year so getting your digital presence solidified is a must! With only a few listings or a slew of properties ranging from all types you’ll want to take a look at the list we created this week. The below is a compilation of easy to set-up websites all free from the WordPress Template database. You want to look for a template that has plenty of attributes so you can organize your properties for a the ultimate user experience. Classifying your properties by type and individual property features ensure flow and ease of navigation. The layout of each property needs to be organized effectively so your user doesn’t get lost. 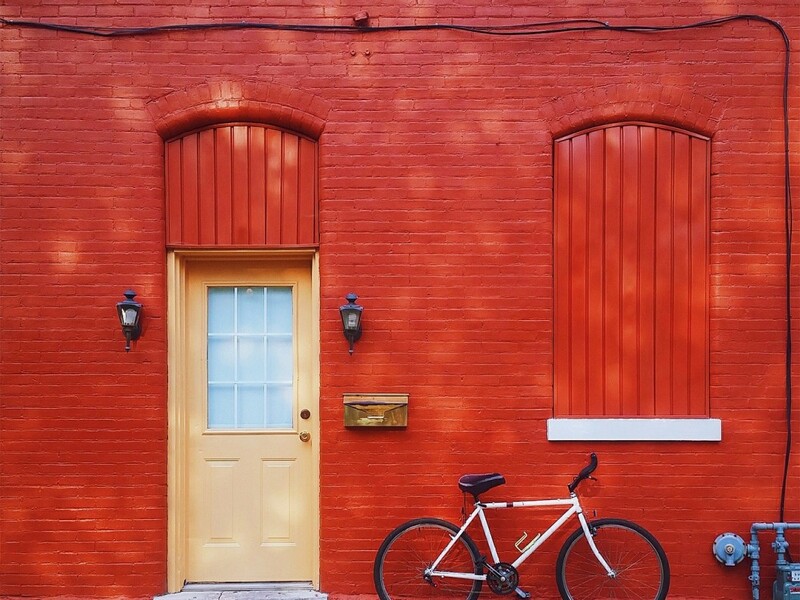 This is why you will want to stick with website templates designed specifically for real estate. All of the below do not require an expert designer. Anyone with a little wordpress knowledge will be able to create and update a flawless site. So on this weeks list we give you 10 free real estate themes all housed in the WordPress database, with one-click download. Please share your comments below. If you have a theme we can feature let us know! A complete WordPress Real Estate Solution for real estate agents and firms. 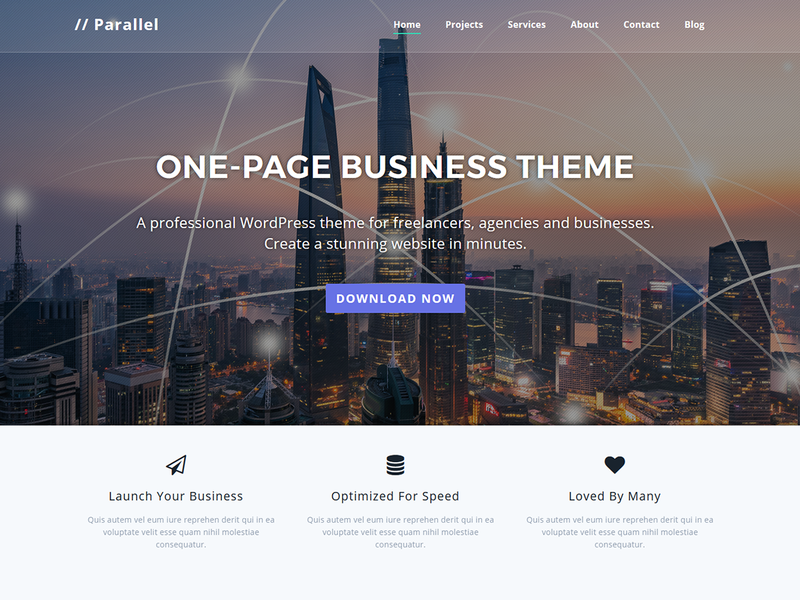 This theme can also be used for building WordPress sites for small businesses. It supports the following front page sections: Featured header image with intro and additional buttons, services section, about us, blog and a contact section. 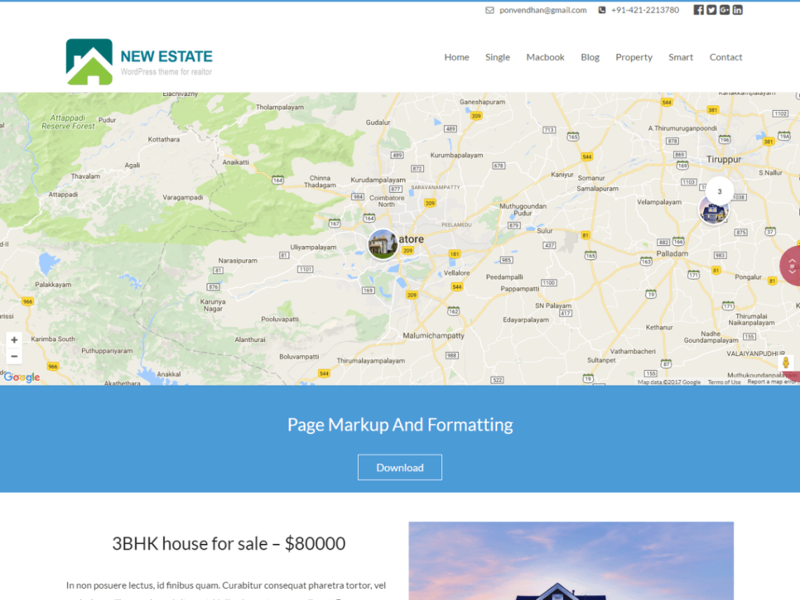 This WordPress real estate theme comes complete with customisation options that include, custom logo, custom header, colors, typography, front page sections (header,about us, services, contact us, blog). The PRO addon plugin adds the full real estate solution with actual properties and agents, property slider, property feature/amenities. 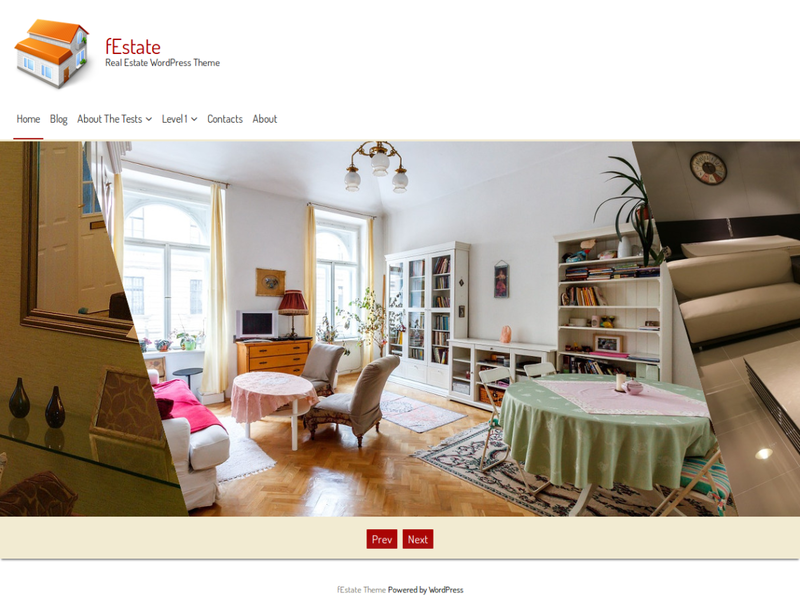 fEstate is fully Responsive WordPress Theme designed for Real Estate websites or blogs. Features include Custom Logo, Multi-level Drop-down Menu, Custom Background, Full-Width Page Template, Widget Areas: Right Sidebar and Footer Content, Search Engine Optimized, Built-in Slider, Multiple Browsers Support, Translation-Ready, etc. 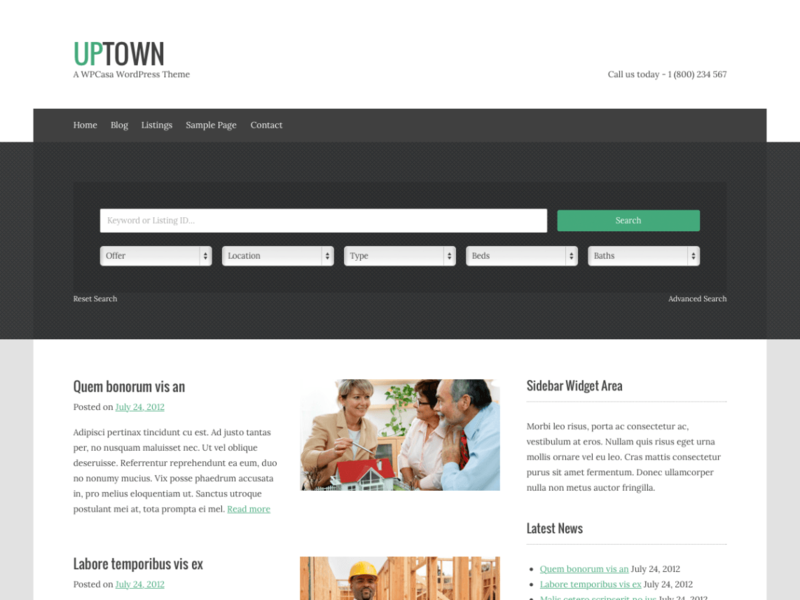 upTown is a simple and clean personal blog theme. Use it in combination with the WPCasa plugin to easily build a fully-featured real estate website with listings editor and property search. 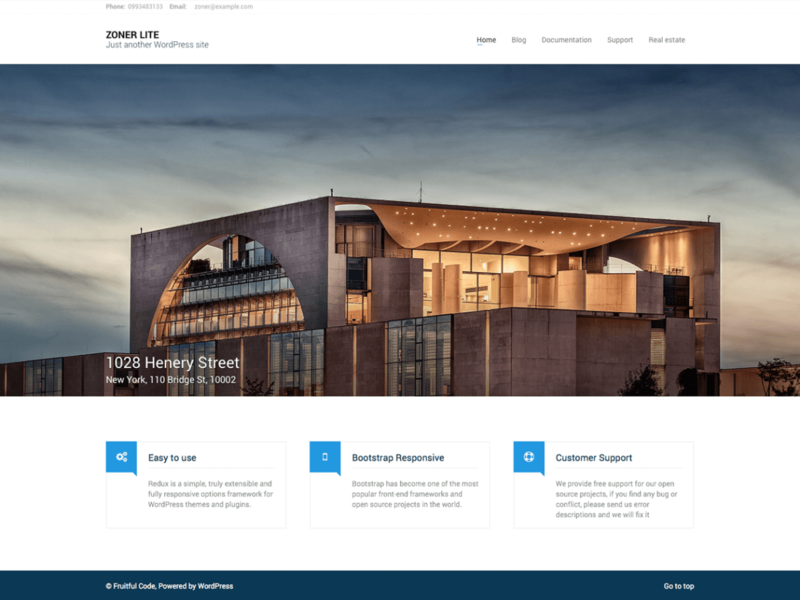 Zoner Lite is a free version of ZONER Real Estate WordPress theme. Flat and clean design, responsive and retina ready, bootstrap 3 grid 1170px, redux framework theme options, visual composer support. Powerful Theme options: adding your Logo, blog options, styling options, header options, slider, menu options, fonts options, social media links, footer options. 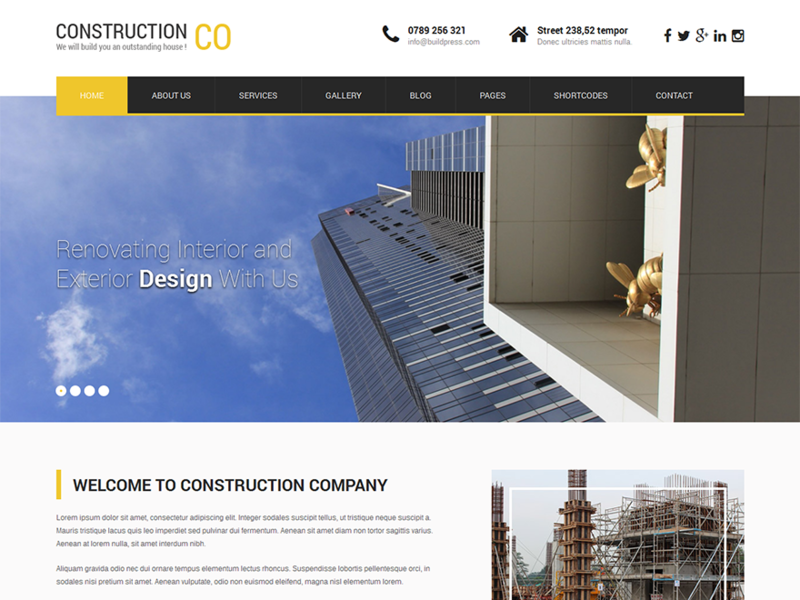 SKT Construction is a construction, architecture, builder, and industry related business, corporate, personal, photography and real estate theme which showcases project galleries, contact info, nicely laid out content, animated sections, and compatibility with WooCommerce, NextGen Gallery and contact form 7. 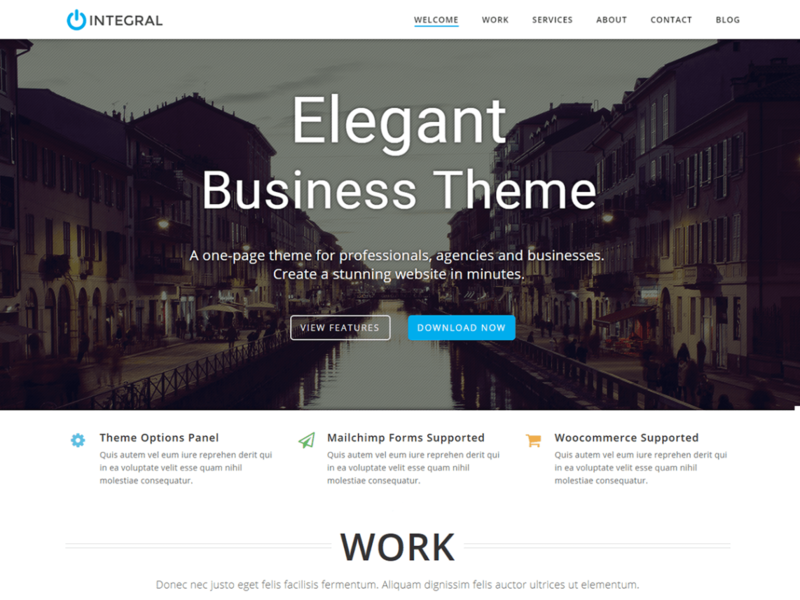 Create a beautiful website with the Integral one page business theme for professionals, agencies and small to medium-sized businesses. Its strength lies in displaying content on a single page in a simple and elegant manner. It’s super easy to customize and allows you to create a stunning website in minutes. It boasts a rich color scheme with light and dark sections and a clean, minimal, modern design with smooth parallax effect. Integral is built with Bootstrap, is responsive and integrates with popular plugins like Contact Form 7 and Woocommerce. 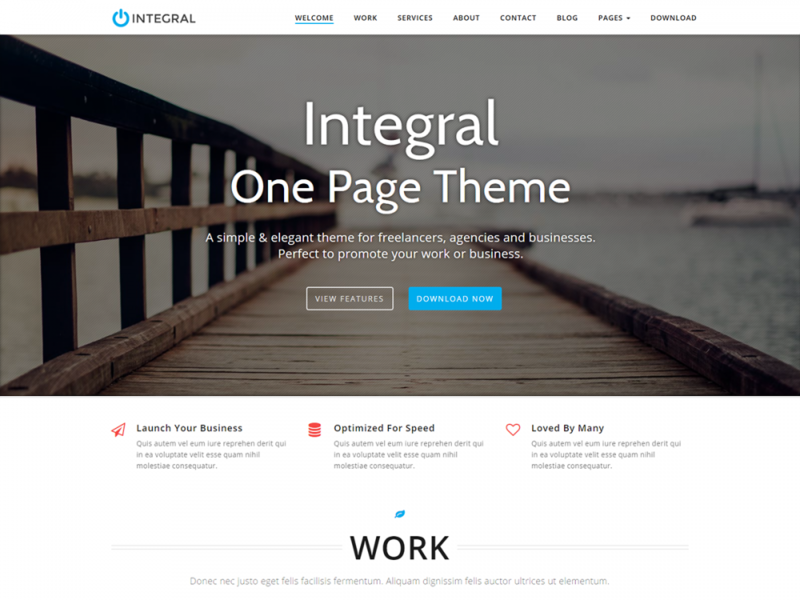 Integral is perfect for design firm, freelancer, development agency, corporate, small business, personal, portfolio, blog, real estate, lawyer and photography websites. 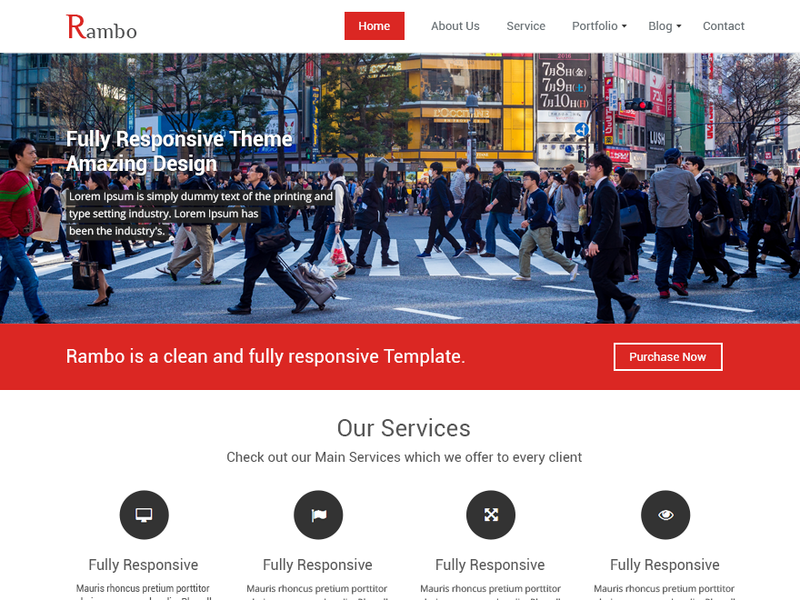 Rambo is an ideal WordPress theme for those who wish to create an impressive web presence. Rambo is easy to use, provides everything you need to create great looking website. It is professional, smooth and sleek, with a clean modern layout, for almost any business types: agency, freelance, blog, startup, portfolio, corporate, firms, law firms, digital media agency , architecture firms, real estate firms, food , fashion etc etc. The theme is developed using Bootstrap 3 CSS framework that makes it friendly for all the modern devices like mobiles, tablets, laptops etc. In Rambo Lite, you can easily set Featured Banner, Services, Portfolio and 4 column widgetized footer. 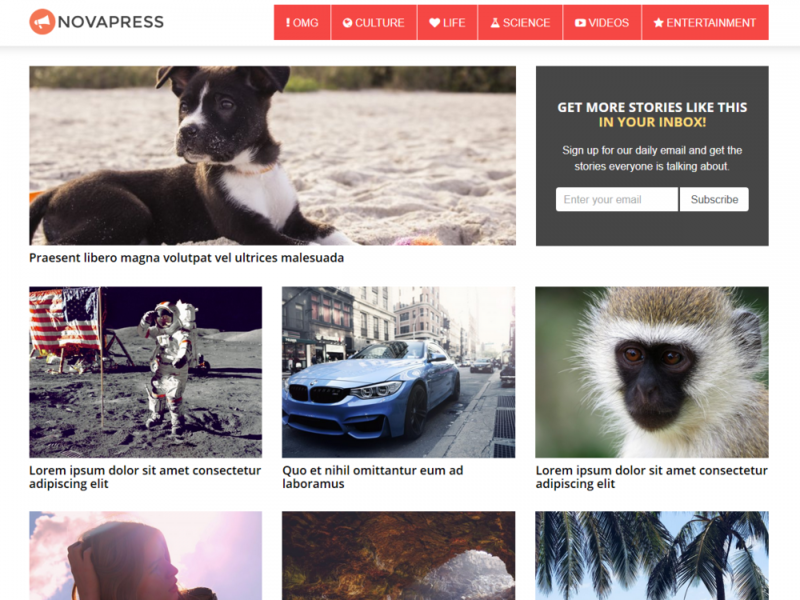 Page templates like Homepage, Full Width Page and Blog left sidebar template will be there. In the premium version, you will get caption Slider, Site Intro, unlimited Services, unlimited Projects, Latest News, Footer Callout, Wide & Boxed Layout, 5 predefined color schemes, feature for creating custom color scheme and Layout Manager. Page templates like About Us, Services, Portfolio, Contact Us etc are there. The theme supports popular plugins like WPML, Polylang, Contact Form 7, WP Google Maps and JetPack Gallery Extensions. Just navigate to Appearance / Customize to start customizing. Both the lite and premium version of Rambo themes are completely translated in Spanish Language. 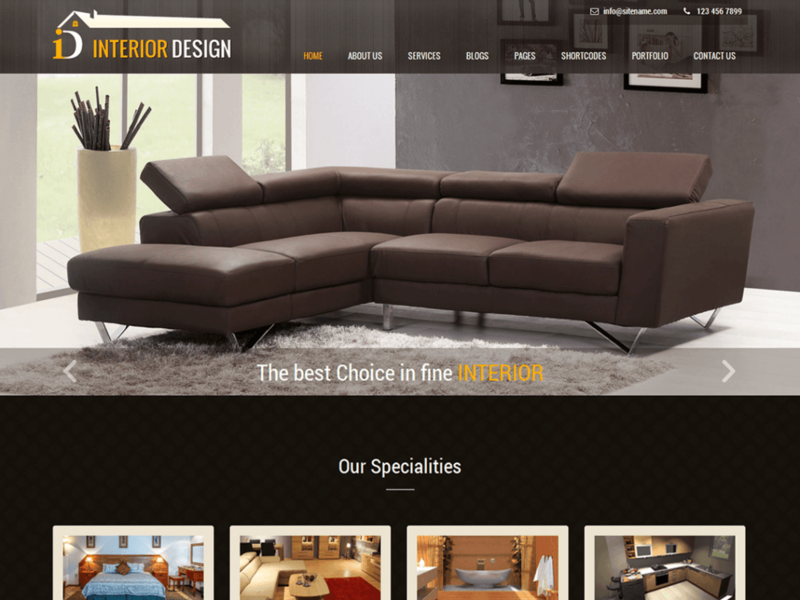 Interior lite is an interior design WordPress theme which can be used as responsive multipurpose WordPress theme that is simple and adaptable and flexible, and is fully translation ready with po file available. Can be used for construction, food and drink, recipes, bakery, business, corporate, cafe and restaurant, personal, portfolio, Ecommerce, agency, consulting, real estate, photography, architect, carpet, cleaning, hotel, furniture, carpenter, home decor, design. It is also compatible with various other contact form, SEO and Ecommerce plugins like WooCommerce and NextGen gallery. 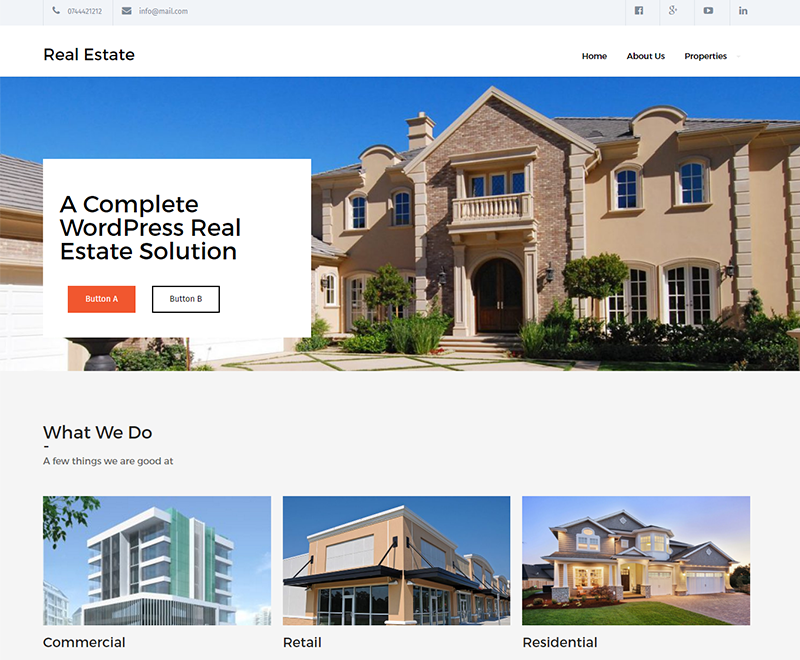 A fully featured WordPress theme for real estate business. It is completely provides all the needs of real estate owners and agents. Capable of handling properties, agents, agencies easily makes it as unique. Bonus feature: Your user can add thier properties to your site and you can earn for that. Pro version has premium features such as elegant property slider, dedicated property map, 24×7 support and more. 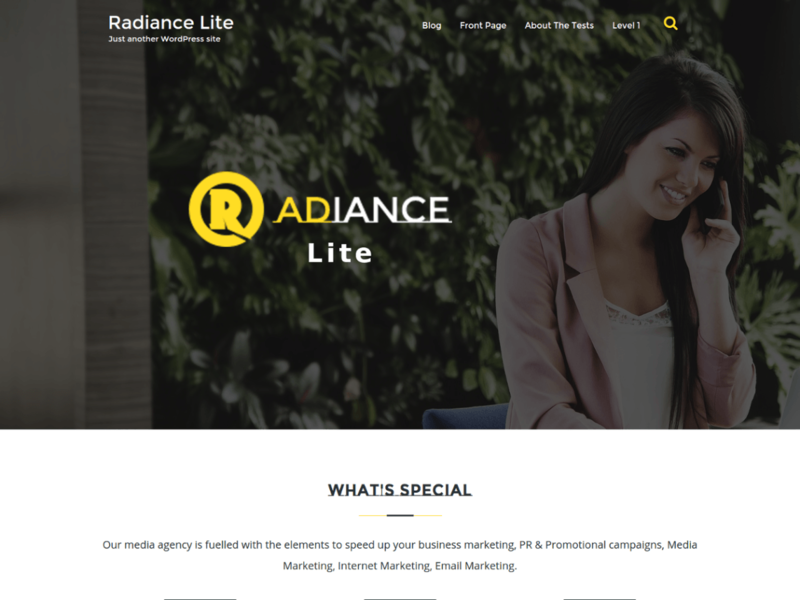 A Single page creative WordPress theme – Radiance Lite packs the credentials of being clean, multipurpose and responsive business theme. It works exceptionally well for real estate, corporate, portfolio or photography site. The sketchboard framework lets you conveniently choose multiple color options for your site. While fully responsive liquid layout gives Rational Lite an equally appealing appearance on mobile or tablets, this WordPress theme also supports multi-level navigation. What more can you ask for…It is free!! !